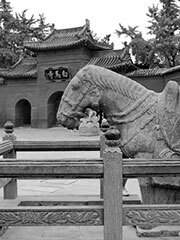 White Horse Temple (Simplified Chinese: 白马寺; Traditional Chinese: 白馬寺; Hanyu pinyin: Báimǎ Sì; also White Horse Ministry) was the first Buddhist temple in China, established under the patronage of Emperor Ming in the Eastern Han capital Luoyang in the year 68. One night, the emperor was said to have dreamed of a deity flying over his palace. The next day he told his ministers, and the minister Zhong Hu explained to him that he probably dreamed of Buddha in India. The emperor then sent a delegation of 18 headed by Cai Yin, Qin Jing and Wang Zun to seek Buddhism. They returned from Afghanistan with an image of Gautama Buddha, the Sutra of Forty-two Sections and two eminent monks. The monks names have been variously romanized as Kasyapamatanga and Dharmavanya, Moton and Chufarlan. The next year, the emperor ordered the construction of White Horse Temple three li west of the capital Luoyang, to remember the horse that carried back the sutras. It was China’s first Buddhist temple. Notably, the emperor ordered the suffix 寺 (pinyin si) to be used in the temple’s name, as a display of respect. Previously, this character had been used to denote ministries of government. In later periods, all temples came to use this character in their name and it was dropped from the names of government ministries. As a result, the temple’s name is sometimes translated as White Horse Ministry, a translation true to the time. However, White Horse Temple is the correct, literal reading to modern Chinese people. The first version of the Chinese Sutra of Forty-two Sections (四十二章經) was produced within the temple. The temple then increased in importance as Buddhism grew within China, and spread to Korea, Japan and Vietnam. The introduction of Buddhism in China was also a significant influence on Chinese morals, thought and ethics. The temple is located within Han and Wei Dynasty Luoyang, which lies approximately 12km east of modern Luoyang, in Henan province. 258 A royal Kuchean monk, Po-Yen, translated six Buddhist text in to Chinese at the temple, including the important Infinite Life Sutra. 1992 With the assistance of Thai and Chinese donors, the Hall of the Thai Buddha was constructed slightly west of the old temple. The temple compound covers an area of 200 mu (13 hectares), and faces south. A stone paifang (archway) has been recently built 150 metres in front of the original gate. Between the archway and gate lies a pool with fountains, spanned by three stone bridges. Entering the temple today, one sees the Hall of Heavenly Kings, Hall of the Great Buddha, Hall of Mahavira, Hall of Greeting, the Cool and Clear Terrace and the pavilion. On each side of the pavilion are the Sutra House and the Magic Weapon House. The temple is open to the public, and can be reached by public bus number 56 from Luoyang Train Station. Standard tickets cost 35元 and discounts are available to students at half price (17.5元).